The What: Extron Electronics has expanded the XTP Systems family with several new extender and I/O board models designed specifically to support video resolutions up to 4K. Each model is HDCP 2.2 compliant, and supports HDMI specification features that include data rates up to 10.2Gbps, deep color up to 12-bit, 3D, and HD lossless audio formats. The What Else: The new XTP transmitters and receivers deliver convenient signal extension from the rack, wall, floor, or lectern. The XTP T FB 202 4K is compatible with floor boxes from OBO Bettermann, MK by Honeywell, Electraplan, and PUK. Transmitters with multiple inputs, such as the XTP T USW 103 4K with connectors for HDMI, DisplayPort, and VGA sources, feature automatic switching between inputs with selectable prioritization for operation in unmanaged locations. Each extender supports embedded digital audio, and most transmitters offer audio embedding as well. The new receivers also provide a variety of capabilities for streamlined operation and integration. The XTP SR HD 4K scaling receiver incorporates Extron Vector 4K scaling technology for uncompromised image quality, and the HDMI output connector on the XTP R HWP 201 4K Decora-style wallplate receiver is oriented upward at a 90-degree angle for easy installation behind a flat panel display. The rack-mountable receivers include audio de-embedding to digital S/PDIF or analog stereo audio outputs along with relays for room control. All receivers and most transmitters provide ethernet extension and insertion of bidirectional RS-232 and IR, allowing LAN access and AV device control at remote locations. The Extron XTP CP 4K Input and Output Boards enable extension of video, audio, bidirectional control, and ethernet over a shielded Cat-x cable. These XTP I/O boards are also HDCP 2.2 compliant, and support video signals at resolutions up to 4K. For further flexibility, embedded digital audio signals can be routed independently for external systems. 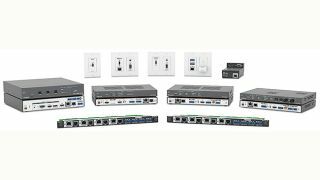 Ethernet extension along with RS-232 and IR insertion provide LAN access and remote AV device control. Signals can be sent up to 330 feet (100 meters). Available in four-input and four-output models, each twisted pair port can supply remote power to a connected XTP endpoint. The Bottom Line: Common features across the line include signal extension up to 330 feet (100 meters) over one shielded Cat-x cable, bidirectional RS-232 and IR for AV device control, ethernet extension, remote power capability over Cat-x cable, and easy setup and commissioning with Extron XTP System Configuration Software. The extenders are available in a variety of form factors to suit any application.